Claude Gellée, known as Claude Lorrain after the duchy where he was born, spent most of his life in Rome where he made landscape painting his specialty and became the most highly paid painter working in the Eternal City. Although he was far from being the inventor of this art form, Claude’s landscapes were favoured above all others for their extraordinary sensitivity to the effects of light and atmosphere (qualities he was able to replicate in the colourless medium of etching), and their presentation of a vision of nature more beautiful and orderly than nature itself. His poetic re-creations of a lost golden age, when human beings coexisted in harmonious alliance with the natural world, find a parallel with the pastoral poetry of Virgil, and his pictures’ deeply evocative qualities have led Claude to be called the greatest of all landscape painters. Claude was a brilliant and avid draughtsman for whom drawing played a crucial role. His finished compositions – both paintings and etchings – are based on studies he made on regular sketching trips in the Campagna, the countryside around Rome, experiences that allowed him not only to observe and transcribe nature but to commune with it and discover its beauty. Claude began making etchings early in his career, around 1630, but it is not known how or from whom he learned the rudiments of the technique. While he might have been introduced to it by his compatriot Jacques Callot (quite possibly when he returned to Nancy in 1625–26), Claude’s embrace of etching can be viewed as a desire for new challenges and part of the swelling interest among painters in this still novel technique during the first half of the 17th century. The catalogue raisonné of Claude’s etchings lists 44 plates, most of which were made in the decade from 1630 and conceived with the aid of preparatory drawings, although few of these survive. His prints are characterised by loose, irregular lines, and his etching style at large lacks the fastidious tidiness and clean definition prevalent in printmaking at this time; but these are qualities which impart an air of freshness and vitality to his compositions as well as conveying the textures of nature. Between 1640 and 1650 Claude ceased etching altogether, probably due to the demands of his numerous prestigious painting commissions, but he took up the etching needle again in the 1650s and 1660s, producing an additional five prints. Despite there being a thriving industry of professional printers and publishers in Rome at this time – offering Claude ample opportunities to have his prints officially published – he evidently preferred to print his plates in his own etching press, which was listed among his studio effects after his death. 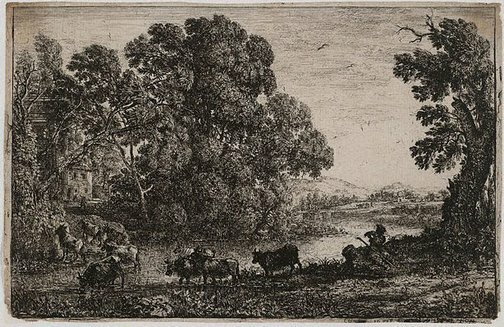 The cowherd represents a bucolic idyll in which a reposing herdsman plays music while his cattle ford a river that meanders through small valleys into the distant vista. A gently decreasing light pervades the tranquil scene, and night seems already to linger about the shadowy trees on the water’s edge. On the left we can just make out a classical temple nestled in the trees. Early states of The cowherd, such as the Gallery’s impression, fully reveal the tones of light and shade which help to give this unassuming scene an aspect of quiet solemnity. It is a work that expresses its creator’s poetic feelings about the simplicity and beauty of life in nature; a work which, perhaps not surprisingly, has long been regarded by collectors and commentators as representing the pinnacle of Claude’s artistry as a printmaker. Signed and dated l.r., [incised plate] "Claudius... 1636... ". Prints & drawings Europe 1500-1900 , Sydney, 2014, p 52, col illus p 53.